Where are all band members from?/Who does what in the band? The band was formed in Belgium back in 2000 by myself and original guitarist Nicolas, who I met at the university in Brussels. We started originally as a 'dark ambient' band but quickly evolved into a doom metal outfit. in 2004 I moved to England and relocated the band. The line-up has changed a lot throughput the years, and currently we have three core members: Aleksej (bass), Kostas (vocals and keyboards) and Valter (guitar) with possibly more to join in the next few months. What was the ambitions of the band when you started? We were very idealistic in the beginning and just wanted to make our music and put it out for people to hear. We didn't care much about labels or even gigs, we just wanted to be heard. Could you explain your music to someone that haven't heard you? It's slow, distorted metal music where keyboards are featured prominently. We use mostly minor chords and have a lot of influences outside of our main genre. The music is rather diverse and goes sometimes into unexpected and uncharted territory. Where was your first gig? It was at the Baroeg (Rotterdam) in 2002. Where was the latest gig? The Garage in London at the Doom Over London event in December 2013.
Who writes your songs?/Who writes the music who writes lyrics? I used to do most of that myself in the past, but nowadays composition is a band effort, although I still write the lyrics. Why did you pick that particular style?/What are your songs about? We didn't really pick up a genre; the sound just evolved naturally when we decided to make music. The tracks are dealing with a wide range of topics, sometimes more reflective and sometimes observations from day to day life. There is a dark edge to most of our tracks, which is not surprising considering the music itself is dark and heavy. We have also released an EP (The Pains of Sleep, 2005) and split CD (Unveiling the Signs, 2010). Do you have any clips on YouTube? There are several clips of our music online. I would recommend that people check out first our official videoclip for the track 'Be Here' which we released on September 2013. Best/worst gig you've played? 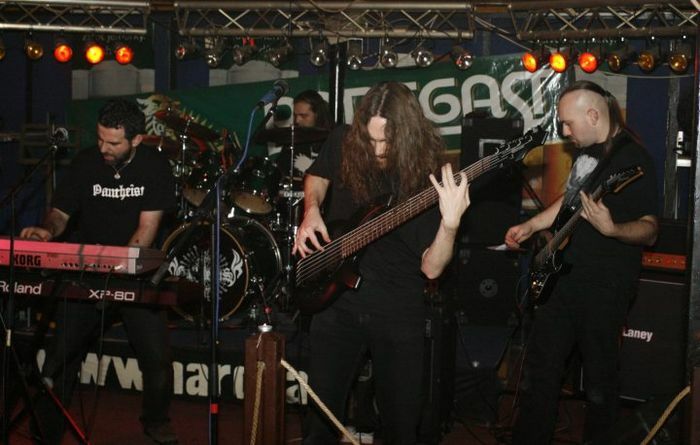 I can think of several gigs that gave me a lot of satisfaction, such as playing at the Brania Fest in Poland (2009), Moscow Doom Fest (2010) and the SWR festival in Portugal (2012). But my favourite must be the gig we played with Skepticism at the St Giles in the Fields church in London in January 2012, it had a very special atmosphere. When it comes to bad gigs I guess it's better not to think too much of them. Unfortunately we had a few really bad ones over the years, most of them luckily many years ago. What places will you be playing in in the imidate future? Currently we are not playing live as we concentrate or re-building our line-up and recording our fifth album. Once this is done we will be looking at playing wherever we get decent offers, but it's a long way from now (late 2015 at the earliest). Have you had any bigger tours from start to now? I don't like to be away from home too long and we all have jobs and different commitments. The longest tours we have done so far only lasted 8-10 days. How big crowds do you usually play for? It depends. We have played in front of a handful of people, but we have also played on festivals in front of 500 or more people. A typical audience in a 'normal' show in London will be around 60-100 people. What are the plans for the rest of the year? We are still writing our album. We hope to enter the studio at some point next year. Where do you usually play? We have played in several countries, all in Europe. Venues can be wide ranging, from small clubs and metal pubs to big stages on festivals and churches! How do you get psyched up for a gig? We usually gather together 30 minutes before the gig as it's important to go on stage like a solid unit rather than a bunch of individuals. Other than that we don't have any special rituals. What are your sources of inspiration? It can be ideas based on inspiration we got from themes/arrangements/atmospheres of other artists (usually non doom metal ones) but sometimes you just want to express a musical idea or mood, so influences can be non musical as well. What's the first step when making a new song? Nowadays we just compose at rehearsal, so someone has to come up with a riff/idea and we all start working on it and take it from there. We have a certain philosophy we try to incorporate in the songs, but otherwise it's a quite open-minded process. How do you feel about the downloading of music instead of buying albums? I have no problem with people downloading and streaming music to check it out. I do however expect people who say they like band X or Y to put their money where their mouths are and support the band, whether this means buying the album, a t-shirt or coming to a gig. For me 'armchair' fans who only say they like a band but don't support it, are no real fans. Especially in the underground scene the financial support of fans is crucial for a band to keep going. What would be your dreams for the band? It would be enough for me to see the band getting recognition for what it does, which usually translates in people buying albums/merch, talking about the band and coming to our gigs. Besides your own music, what genres and bands do you listen to? I listen to a wide range of music: metal, rock, classical music, electronic music, progressive or ethnic genres...basically everything with passion and creativity in it. Have you been in any other bands? Yes, I have played in many different bands/projects over the year, such as Crippled Black Phoenix (experimental/post rock), Ereipia (neoclassical music), Wijlen Wij (funeral doom metal), Aphonic Threnody (funeral doom death) etc. Currently I am also playing in Landskap, a London based psychedelic 'doom rock' project and I make solo electronic based music in my spare time. I have also helped out friends with their own bands/projects, such as Se Delan, Clouds and A Dream of Poe. What do you work with outside of the band and the music? I work for Victim Support, a charity which helps victims and witnesses of crime. Playing music is just a hobby, even though a time consuming and expensive one! What would you do if there was no music? Not sure. I can not imagine my life without being able to let off steam creatively. Maybe I would be a writer? I used to love writing when I was younger. What's the funniest/most memorable thing a fan has done for you? When we played in Moscow, a Russian fan was following me around at the venue after our gig. He had his friend with who spoke a bit of English, and had written on a piece of paper some questions for me in Russian, which his friend was translating. Most of them were rather personal questions, like 'do you believe in God' or 'what's your favourite colour'. Rather surreal stuff. Name 2 of your own songs you like at the moment? I'm quite proud of the tracks 'The loss of innocence from 'Journey Through Lands Unknown' although I would love to re-record it with a real orchestra and choir if i could; and 'Be Here' from our latest, self-titled album. Two very different tracks that mean a lot to me. What do you feel is the best live band you've seen? Hard to pick only one, but Skepticism is one of the most impressive bands I have seen live; I have already seen them 15 times and every time they were thoroughly engaging. Do you have any webpages? Out official website www.pantheist.co.uk has information about where else we can be found on the web. How do you view the musicindurty of today? I don't know if you can call this an 'industry' at our level. Labels also seem to be ran by passionate individuals who like the type of music we play rather than businesspeople. I think the time where you could rely on a label for a 'budget' is now over. The music industry is still important though as it helps spread the word around about your band through the right channels, so that bands can concentrate on writing and playing music instead.